The Megamouth Shark is an exotic species which was discovered in 1976. It was accidently caught in a deep-sea anchor. Its scientific name is Megachasma Pelagios. Since 1976, there have been less than 60 confirmed sightings. This shark species can be found in the Indian, Atlantic, and Pacific Oceans. As the name suggests, this shark has a large mouth that can be as wide as 4.25 feet although it has small teeth compared to the huge size of its mouth. It also has a large head. It is one of only three known plankton feeding sharks, including the basking shark and the whale shark. This shark belongs to the order Lamniformes, family Megachasmidae and genus Megachasma. The Megamouth shark has long gill slits but not long enough to reach the dorsal surface of the head. Their color ranges from dark gray brown on top and light gray to white below. These sharks have 50 rows of tiny teeth on each jaw, but only the first three rows are functional. They have photophores around their mouth. They glow and appear to act as bait for small fish or plankton. This shark is considered to be a poor swimmer and less active as compared to other species. It has pectoral fins which are smaller than its head in size. It also has an asymmetrical caudal fin with a long upper lobe. Declan, Tobin. " 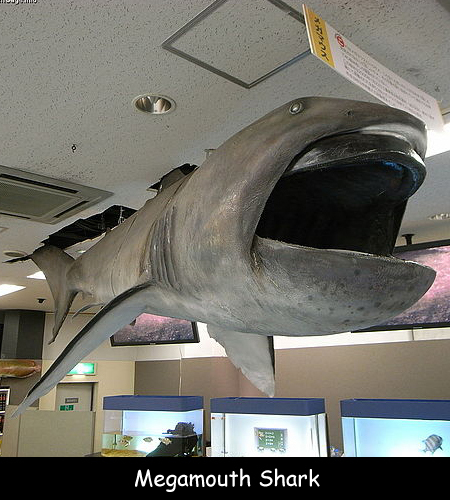 Facts for Kids about Megamouth Shark ." Easy Science for Kids, Apr 2019. Web. 21 Apr 2019. < https://easyscienceforkids.com/megamouth-shark/ >.